N-Mark Spade Panels, also known as Matching Game Panels, Card Matching Games, or or Matching Game spaces, are Spade Panels in Super Mario Bros. 3 that appear on the world map every 80,000 points gained, and they allow Mario or Luigi to play a card game where they must flip cards to match pairs of images with only two mistakes allowed before exiting the game. When the next 80,000 points are earned, the player can resume the game until completed. 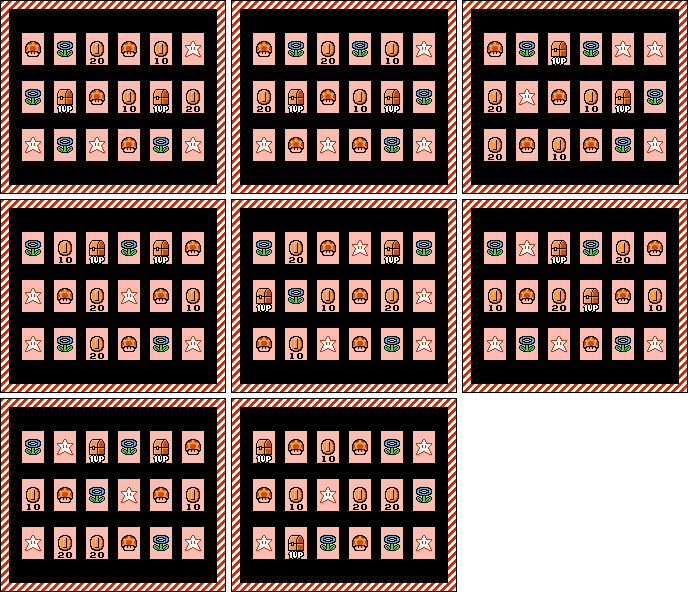 For each card pair successfully matched, the player gets that prize for their inventory, for a total of nine prizes per game. The game randomly selects one of the eight predefined configurations. Here are the possible combinations. ↑ Super Mario Bros. 3 English instruction booklet, page 22. ↑ Nintendo Power Volume 13, page 10. ↑ Super Mario All-Stars Player's Guide, page 110. ↑ The Super Mario Advance 4: Super Mario Bros. 3 Player's Guide, page 11. ↑ Super Mario Bros. 3 Japanese instruction booklet, page 19. This page was last edited on March 5, 2019, at 20:17.